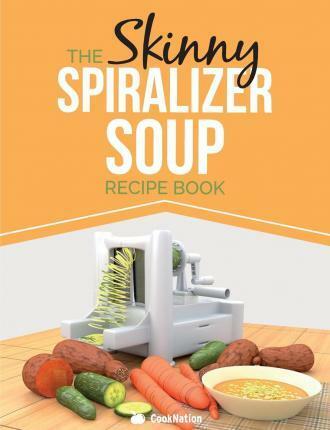 The Skinny Spiralizer Soup Recipe Book Delicious Spiralizer Inspired Soup Recipes All Under 100, 200, 300 & 400 Calories “Good soup is one of the prime ingredients of good living. For soup can do more to lift the spirits and stimulate the appetite than any other one dish.” Louis P. De Gouy, ‘The Soup Book’ (1949) Soup is the ultimate comfort food: warm, hearty, filling, tasty, healthy and easy to make. It comes in a multitude of different forms: creamy, textured, chunky, hot or cold, spicy, tangy… the list goes on. Made from fresh ingredients or leftover cuts from the kitchen, soup can find a place in every kitchen. Our skinny soups are balanced, healthy low calorie, delicious and now thanks to a vegetable spiralizer can be even more fun to make and eat. The joy of using a vegetable spiralizer to create fun veggie noodles, spaghetti, ribbons, ‘rice’, spirals and more can enhance your soups to a whole new level. From classic vegetable broths to nutritious protein packed chicken ramens. The vegetable spiralizer isn’t just for vegetarians. Our skinny soups include, meat, seafood and vegetables options and are perfect as part of a balanced diet. They can be instrumental in helping you lose weight or maintain your figure without compromising on flavour, taste or leaving you feeling hungry. All our recipes serve 4 and fall under either 100, 200 or 300 calories per serving. You don’t have to be a great chef to make a great soup. All our skinny spiralizer soups are easy to make with readily sourced ingredients and minimum prep time. You may also enjoy other titles in the Skinny series including The Skinny Spiralizer Recipe Book.